After trialling La Roche-Posey’s Toleriane Ultra Fluide for over a month now I feel as though I can give this product a full and honest review. If you’ve read some of my other skincare posts, you’ll already know that I have problematic skin. I have issues with spots, redness and occasionally other irritations crop up. So basically, in short, my skin has issues. I haven’t been to a dermatologist about it because quite frankly I can’t afford it. So instead I trial skincare products I have read a million and one reviews on. The entire Toleriane line is purposely designed by dermatologists for people with sensitive skin to soothe, calm and protect, while also reducing sensitivity day after day. There are many products within this range, including cleansers, a makeup remover, loads of moisturisers, and many more items, making there something for everyone. The only issue I have with La Roche-Posey’s products is that within each range there is such a variety, which makes it a little daunting if you don’t know where to start. However I found that by doing research it became easier to understand what I was looking for. Which is why I wanted to add my own review to the mix. After my own research, I chose the Toleriane Ultra Fluide because it not only focuses on sensitive skin, but it is also designed for normal to oily skin types (if you didn’t know I have combination / oily skin). 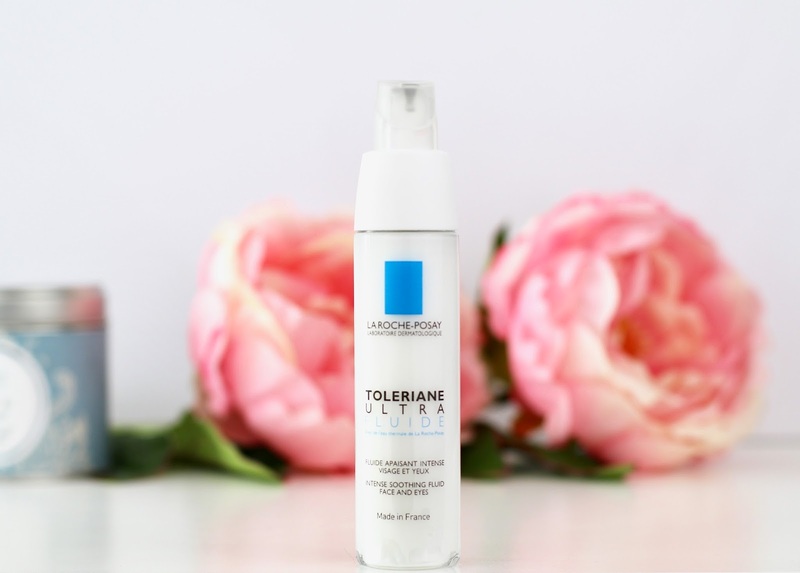 If you are looking for a more hydrating moisturiser for sensitive skin the Toleriane Ultra would be the one for you. The consistancy of this product is somewhere in between a cream and a gel – making it not too thick for oily skin types, but not so thin that it doesn’t feel like you’ve put anything on. With saying that, it does sink in very quickly, so you hardly notice it under a minute. I tend to use 1½ to 2 pumps of this to moisturise my face and neck, and although it says it is a day time moisturiser I also use it in the evening. Over the past month I have noticed that my skin does not appear to be as oily as it normally did by the afternoon – or evening for that matter. I do not know whether this is because of the ingredients within the product, or if it is just to do with the texture and how quickly it sinks in. But whatever it is, I’m loving it! Additionally, the redness in my skin has been reduced – aside from the scars from spots (thanks chaps! ), and I no longer have any irritations or random texture bumps, which is great. Another thing I have noticed is that my ‘run of the mill’ spots look less aggressive than they did before using this moisturiser. An add on bonus with this product is that it is dispensed via a pump, which keeps the product hygienic. However due to the packaging I cannot tell how much product is left in the container so I will probably have to have a backup in my stash waiting for the time it runs out. **Update: since writing this post I have learned that the product is contained in a vacuum-like bag within the bottle, so when it’s running low you can clearly see the bag and the remaining product in it. Overall I think this product has done very well for my skin, but I still need something to help combat my spots. I already knew that the La Roche-Posey Toleriane Ultra Fluide would not reduce the occurrence of spots, but I wanted to see if it would help with my other issues – which it has. I’m now currently trying the La Roche-Posey’s Effaclar Duo+ Anti-Blemish Cream with the Toleriane Ultra Fluid to see how this combo works and if my spots improve. Stay tuned for a review! If you’d like to read more of my skincare related post, check them out here. Do you have any skincare recommendations for sensitive and blemish prone skin?